Google Sidewiki, a project I've been working on launched last week. Sidewiki is a web annotation system currently available in Google Toolbar. If you're interested in this project, follow @googlesidewiki on Twitter and submit product ideas! I have a Dell E521 with Windows Vista and I wanted to buy a SATA drive for it. I went to Fry's and decided to buy the Seagate 1.5 TB drive since they had a sale and this drive was the same price as 1 TB drives. I got home, replaced the old drive with the new one, rebooted, installed Seagate software (DiscWizard) and started to format the drive. 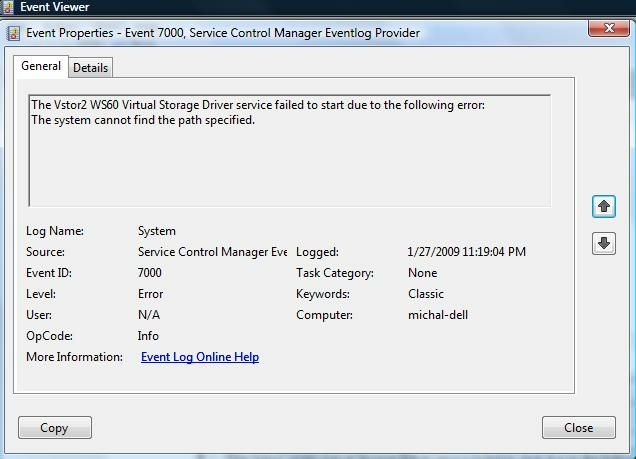 Almost immediately, I got an error: "Failed to read from the sector -1,644,227,123 on the hard disc 2". This is not good I thought. But it was very suspicious that the number was negative and that I got the error so quickly, so I decided to use the built-in format feature of Windows. Since I got this error, I decided to go for the full format rather than quick format. As you can expect, it took many hours. After about 4 hours, the format was stuck at 75% and I decided to go to bed. When I got up in the morning, it was still at 75%. At this point, I decided to give the quick format a try and like Seagate's DiscWizard, it reported an error almost immediately. OK, the drive is bad then. I went to Fry's and exchanged the drive for a new one. I inserted it, tried DiscWizard and got the same error (although for a slightly different negative number). Quick format also got me an error. The fact that the full format failed previously at 75%, made me decide to format the disc for only 1 TB. This took many hours and eventually worked! I now had a 1 TB drive for a price of 1 TB drive (since it was on sale). 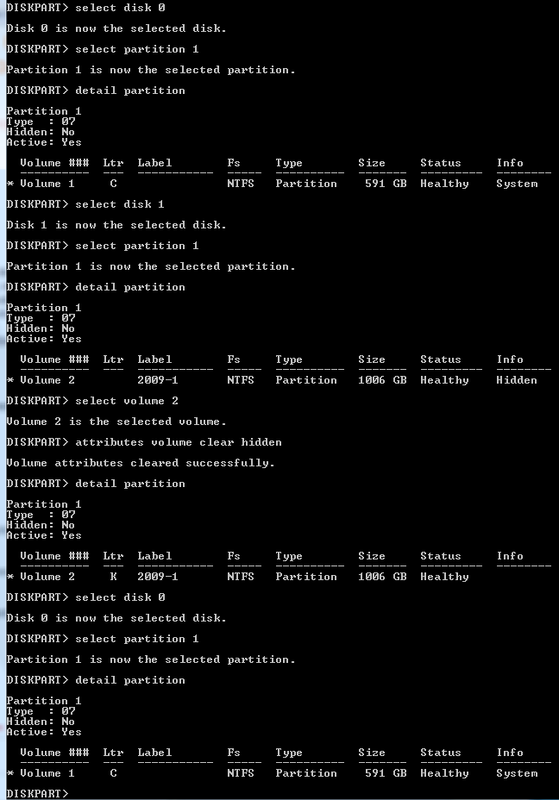 Great, I marked the partition as "Active, Primary Partition" and assigned it letter D.
Now I rebooted the computer to make sure that everything worked. No disc D. Well, perhaps I forgot something. I look in the disk management tool and I see that the partition is there. It's still Healthy, still Active and still Primary but the letter assignment is gone. I assign the letter again and reboot. No dice. OK, let me check the system log. 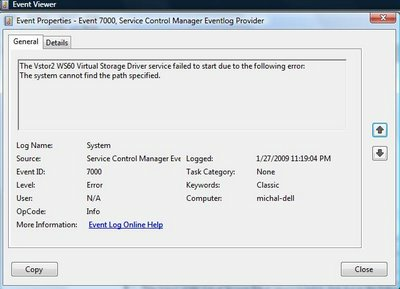 Sure enough, the event viewer shows an error: "The Vstor2 WS60 Virtual Storage Driver service failed to start due to the following error: The system cannot find the path specified". So, I wasted probably 10 hours of my life because of buggy software. And why doesn't the default disk management tool even tell me of the existence of the Hidden attribute. What if this happened to someone who knows even less about computers? After all, I may not be the biggest expert and perhaps there exist people who would immediately know what was wrong and the using diskpart was the fix but I mentioned this to a few friends who like me have been using computers for years and everyone was amazed how bad this experience was. Maybe this blog past will help others who run into this problem. I'm guessing this this problem is confined to Vista but there must be other Vista users who want to install this drive. 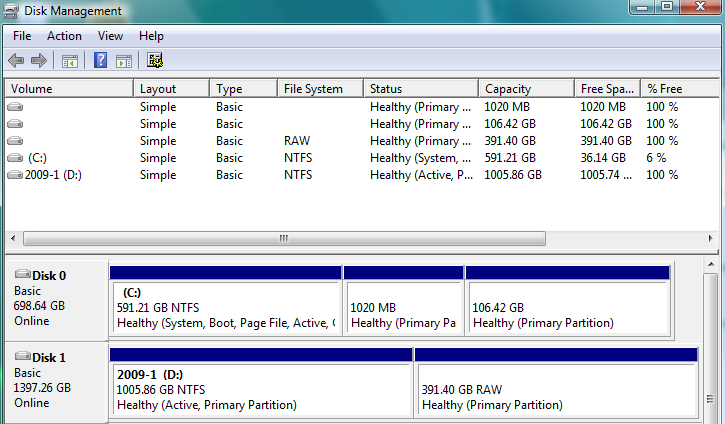 And if anyone knows how to use all 1.5 TB on Vista, let me know! The party in Warsaw is organized by Polsat (a Polish TV station). The stars there include Abbacapella (apparently a German band). The party in Wroclaw is organized by TVP 2 (another TV station). ABBA music will be performed there by a Swedish group Arrival. An it seems that Modern Talking is the biggest star there. ABBA tribute bands are listed here (Arrival is there but not Abbacapella). The list is longer than I expected although I know that I shouldn't be surprised. I have had pretty bad experiences with Comcast. I first got their service and very soon I started to be very unhappy with the service. I then tried to cancel the service but I have been unsuccessful in canceling the service. The situation is very bizarre and I got really tired after spending hours with their customer service, so I asked for advice and I ended up doing what my friends suggested: I made my story public by creating a blog that describes in details what happened. Check it out! And if you have any advice, let me know! 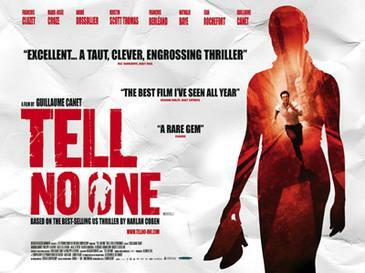 I just watched Tell No One at the Aquarius . I haven't watched such a good film for a while. A few things were not very believable and some viewers may not like that fact that this neither a pure action flick, nor a pure romantic film, nor a pure drama. It has a little of each and I'm not sure how to categorize it. Occasionally I want to share information with my friends on children-related topics. I decided to create a separate blog for this purpose. I have recently created flash cards for the teaching Polish alphabet. The flash cards are designed for toddlers, so they have simple, colorful pictures and simple words containing each letter. I've created a separate web page for "resources for teaching Polish to kids" but chances are that those flash cards are the only thing I will ever put on the site. It was surprisingly easy to find images that I could use. I downloaded most of them from the public domain clip art repository (http://www.wpclipart.com). One exception is the picture for "ź" which is from http://commons.wikimedia.org. Letter "ź" is by the way the one that was most difficult to find a good word for. Some Polish words can never be at a start of a word, so I could easily give up for them but in general, I wanted for each letter a word that starts with this letter. For "ź", I considered following words: "źdźbło", "źrebię/źrebak", "źródło" i "źrenica". I liked most "źródło" but couldn't find a good image for it (if you have one you can suggest, please let me know). I didn't want to use "źrebię" because my daughter (she was 2 when I started working on the cards) would easily confuse it with the word "koń" or "kucyk". Similarly I didn't want to have to explain the difference between "źrenica" and "oko". So, I ended up using "źdźbło" but this word has four consonants in a row which doesn't really make it the best choice for one of the first words you learn in Polish. I don't have right now enough time to go all the way but I have just converted my blog's template to partially support hAtom. I think that hAtom is great and some time ago Kevin Marks and I implemented support for hAtom in Blogger templates. Our work means that all new blogs that are created on Blogger and hosted on Blogspot have hAtom enabled by default. But my blog uses an old template that does not benefit from this new code. It is hard or perhaps even impossible to support hAtom completely with the old templating system but I did as much as I easily could. Here are template elements I modified in my blog (the template used by me is called "Herbert"). In my quick-and-dirty notation below I use bold font combined with underline to show new things added to the template. This gets me most of the way to supporting hAtom but those pesky timestamps are more tricky and I will live without them until I completely change my blog's templating system. I already had a similar post but now I want to write about since this has been the first week in two years that I biked every day. Usually there's at least one day a week that I need a car or have to go somewhere else, so I have never achieved this until now. To celebrate, I took a camera with me and took a few pictures. I am also testing the new Picasa Web feature and including a slide show from the ride. I will be again at JavaOne this year. I am co-presenting JSR 277: Java Module System. I should be around at JavaOne all of Thursday because I also plan to attend the JSR-294 session (Java Language Modularity with Superpackages) and on Tuesday night to attend the BOF that will talk about both JSRs (Modularity in the Next-Generation Java Platform, Standard Edition (Java SE): JSR 277 and JSR 294). If you are interested in chatting about Java modularity and will be at JavaOne, drop me a line. I wanted to publish some videos on my web site in a way that is embeddable in a web page. An additional constraint was that I didn't want to spend much time to learn how to do it. It turns out that quite quickly I found the right tools using Google search. The first step is a conversion to the FLV (Flash Video) format. For Windows there is a free encoder called Riva VX. I downloaded it and in a few minutes I converted one of my videos to the FLV format. After many years, I will be coming to JavaOne again this year. The main reason is to co-present some early information about the Java Module System (JSR-277) at a BOF on Tuesday night. You can see a bit more details in Stanley Ho's blog. JSR 294: Improved Modularity Support in the Java Programming Language is closely related and if modularity in Java interests you, you should also consider going to a presentation by Gilad Bracha at JavaOne about that JSR. I am in charge of the web site for next year's CGO (International Symposium on Code Generation and Optimization). This year's conference just took place in NYC and next year we are moving back to San Jose. This is pretty amazing: the European airline Ryanair made claims that it might offer gambling on its flights and that gambling would generate enough revenues to make flights themselves free. It's hard to say if this is just a publicity stunt or the future of cheap flights. I have discovered by accident that Wikipedia has an entry about the Polish poem Chrząszcz which contains the most famous Polish tongue-twister. They even have an audio recording. Even more amazingly they have a whole list of tongue twisters in many languages including quite a few in Polish. I keep being amazed by the breadth of Wikipedia. 529 is a name of a college-savings plan in the US. I don't really know much about them but I've just happened to read an article about them in the Newsweek. California's 529 plan is the Golden State ScholarShare College Savings Trust. So do this plan's fees compare with the Newsweek guidelines on fees? The combined two fees should be under 0.8% and for the ScholarShare they are exactly 0.8% which probably means that if you pay the California state income tax and you plan to invest in a 529, you should choose the ScholarShare. During my last trip to Poland, I have been going through my old papers. One of the things I found was a copy of my MSc thesis from the Silesian University of Technology. Unfortunately, I couldn't find the electronic copy of the dissertation but I scanned parts of it and created a pdf file. The thesis is entirely in Polish but I have just created a short abstract in English. 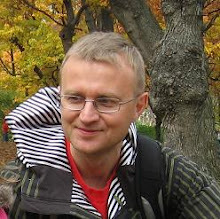 The title can be translated into English as Code Generation in the IIPS/Ada Compiler (original Polish title is: Opracowanie i wykonanie modułu kompilatora języka Ada systemu IIPS/Ada generującego kod wynikowy w postaci P-kodu). Unfortunately, as far as I know the IIPS/Ada system was never finished. I guess there were not enough graduating students who wanted to write parts of an Ada compiler system. For the curious, IIPS stands for Instytut Informatyki Politechniki Śląskiej (which means the Computer Science Institute of the Silesian University of Technology). I haven't really stayed in touch with anyone from my alma mater but I can see that my advisor, dr inż. Przemysław Szmal is still there and apparently he is still teaching compilers. This dissertation describes one module of a larger system that was supposed to be a complete set of development tools for Ada. The code generation module described here took the output of earlier compiler phases in the form of the DIANA intermediate language and generated low-level code for an abstract Ada machine. A major part of the works was the design of a language for a virtual machine for interpreting Ada programs. We took the P-Code designed with a similar purpose for Pascal (it was used in the UCSD p-System) and extended it into a language we called A-code. The dissertation consists of 7 chapters. Chapter 1 presents motivation and describes the overall IIPS/Ada compiler system. Chapter 2 describes the DIANA intermediate language. The bulk of the text is in Chapter 3 that describes the A-Code language. The Turbo Pascal implementation of the code generator is described in Chapter 4. Chapter 5 is the user manual for the code generator and Chapter 6 describes which features of Ada have been implemented and which have been omitted. Conclusions are presented in Chapter 7. Appendix 1 contains the grammar of DIANA. Appendix 2 describes all new A-Code instructions (i.e. those that are not part of the P-Code language). Appendix 3 defines a compiler runtime library that is given in the form of A-Code procedures that can be called from the generated code. Appendix 4 gives the DIANA encoding of (parts of) the STANDARD package. Appendix 5 shows examples of test runs. The tests consist of small Ada procedures or packages manually translated into DIANA. These DIANA representations of the Ada source code were translated by the code generator and the generated A-Code representation is included in the text. I forgot to write about this earlier but the Call For Papers for next year's Conference on Virtual Execution Environments has been posted. The submission deadline this year is on 15 December 2005. VEE 2006 will bo co-located with PLDI.